Today's post uses another set by The New Black. If you'll recall, The New Black is all about making hot nail trends available to anyone and everyone, and today's set is no exception! 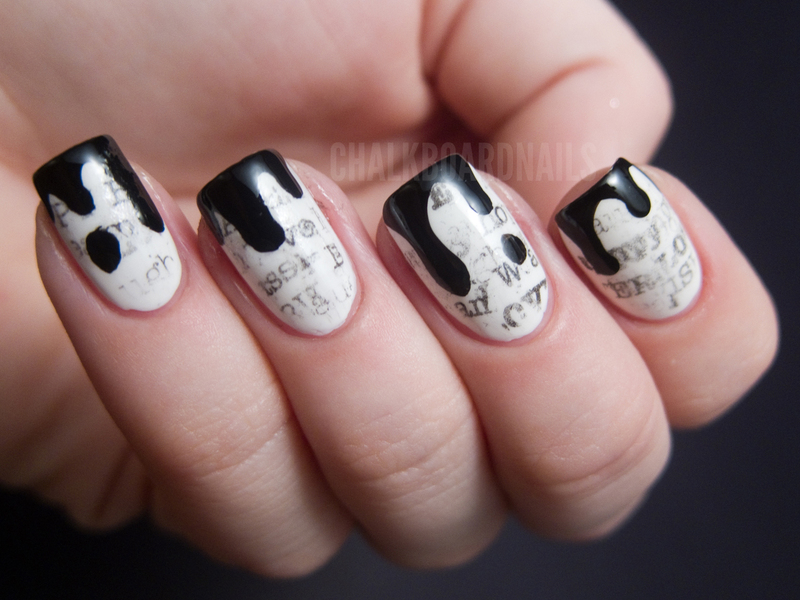 Newsprint nails have been popular for quite some time now. I haven't tried one out yet, so I was excited to give this set a try! It comes with a neutral base color (this one is a white), sheets of printed text, "transfer solution," and topcoat. The nice thing about this set is that the words on the sheets are printed backwards, so they show up forwards once you transfer them to your nail. With the standard newspaper technique, the words always end up backwards. To prepare for the newsprint part of the manicure, you need to first paint your nails with the base color, and let it dry completely. I used a quick dry topcoat to speed mine up. Then, I followed the instructions that were printed inside the kit. They say to put the transfer solution on your nail, then place the paper down and hold it on with a cotton ball for 30s. After doing this, I removed the cotton and tried to remove the paper, but unfortunately bits of the paper had come off along with the ink and had gotten stuck to the nail. Maybe my base was only 99% dry? I think what is more likely is that the paper was too dry and needed more transfer solution. It was only after I finished this manicure that I watched the video for this kit on The New Black's YouTube. I learned you are supposed to put the transfer solution on top of the paper, too. I'm sure that would have helped and I'm not sure why that isn't included on the printed instructions in the kit. So one nail in my manicure was already kind of imperfect, but I decided to roll with it and make it look intentional! I grabbed the sheets and started applying them kind of willy nilly wherever I wanted, doing multiple layers, etc. It's not the exact intended look for the kit but I think its interesting! Then, to add to the crazy-typography effect, I added some ink drips down from the tips. These were just freehanded on with a small striper brush. I used a black from a different The New Black kit (you'll see it later, it's a great black). While I didn't get the kit to behave the way it was supposed to THIS time, I think the final result still turned out cool. I do intend to try it again with the video's technique and will likely post again with those results. 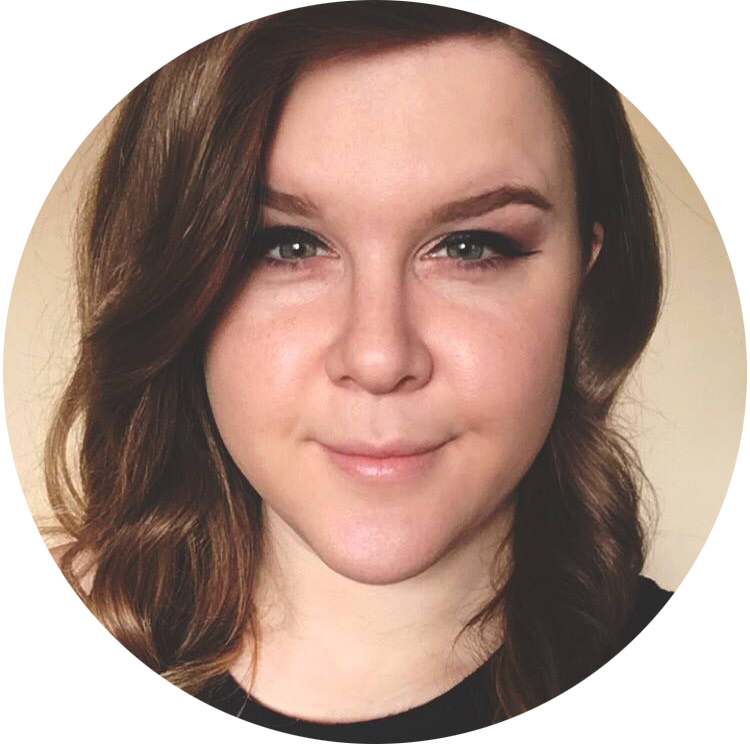 You can find more information about The New Black on Facebook, Pinterest, and YouTube. Their products can be found at Sephora and Nordstrom. The typography sets (also available with different base colors) retail for $16. This is so cute. I love the ink drips. Wow, that looks awesome! The dripping ink was an inspiration. 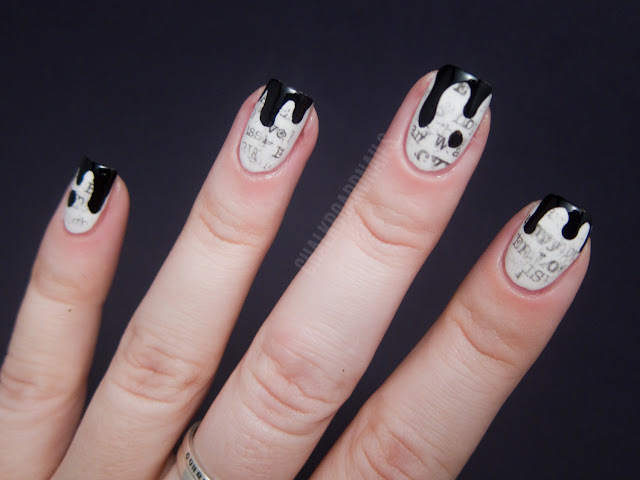 Hey, I've been wondering for a while now, is it possible to transfer ink from pages in books onto nails? Gracey, I'm not totally sure! I think it depends on the type of ink and paper and stuff. I would definitely give it a shot, I think people have successfully transferred maps before so who knows what else is possible! great idea!!! looks soooo cool! I love this!! I think you did an amazing job with it, especially the dripping ink. I love the final look! It looks very cool! Love this! I like the dripping ink, too! I'm speechless, I really adore this! such a nice change up to the old text nails! So cool! I like the addition of the dripping ink tips, they're super cute! what a cool idea for a nail kit!i love love love how you wore it! i looks like you dug your fingers in ink, so cool! Very, very cool.... I love it! Those are so cool! I've been dying to do a typography manicure! Such a cool look! And for someone that works with fonts and graphics, I need to get me this pronto! 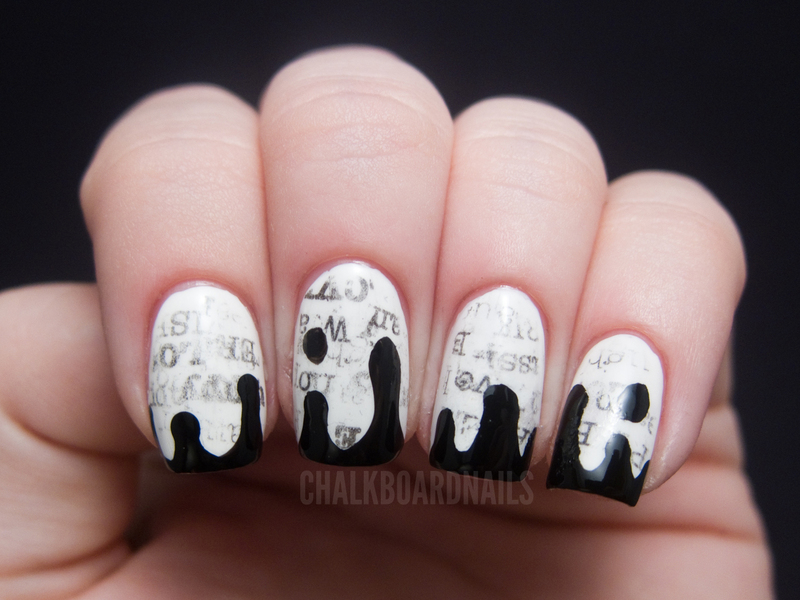 LOL I love the way you did the dripping ink. Fabulous! This is so cool! I'm going to try it! This set is very intriguing! 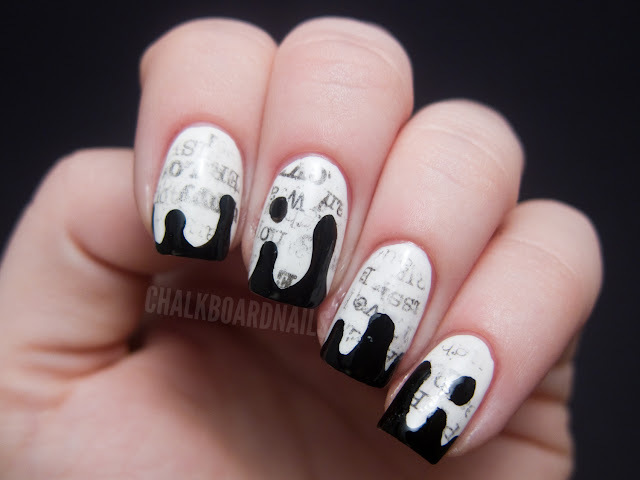 I've never thought about transferring printed pages onto nails. I'll have a check for this set! That is fabulous! It might not be what the kit intended, but it's definitely the neatest transfer mani I've EVER seen! I like your version so much! It's very unique while staying right on trend! Great job! This mani is really cute and fun! I have a friend who does this, instead of buying transfer solution she uses cheap vodka.